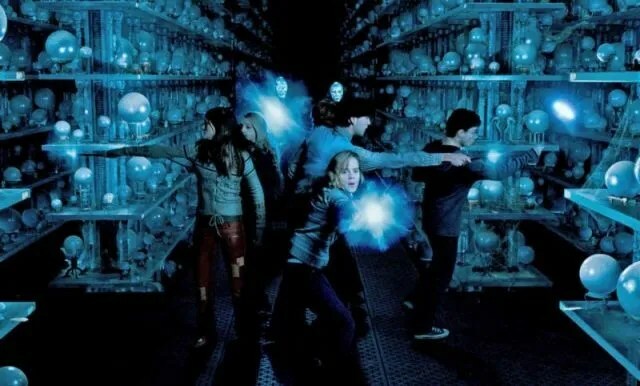 The Harry Potter movies have always been hinged on the central mysteries. This is usually the unlocking, discovering, decoding or understanding of the titular macguffin until we get to the usual Voldemort linked finale. Unusually, The Order of the Phoenix isn’t necessarily following this pattern and instead gives us a great central villain for the duration of the movie. It isn’t Ralph Fiennes’s villain, although he does return in all his glory and does a good job of almost stealing the movie, but instead another classic British actress has been cast to play the more sneaky villain of this movie. Imelda Staunton plays new teacher Dolores Umbridge and gives the students, and the audience, a great foil to rally against. Umbridge has some very dastardly moments, from a torturous punishment methods, the sacking of a popular teacher and the eventual controlling of the school itself. It all plays out very coolly and calmly and all you can do is watch in horror as things unfold. It doesn’t help that Michael Gambon’s Professor Dumbledore is also acting strange and unlike the heroic mentor he has been all this time. It makes for a very interesting Harry Potter movie and one with much more depth than some if it’s previous incarnations. 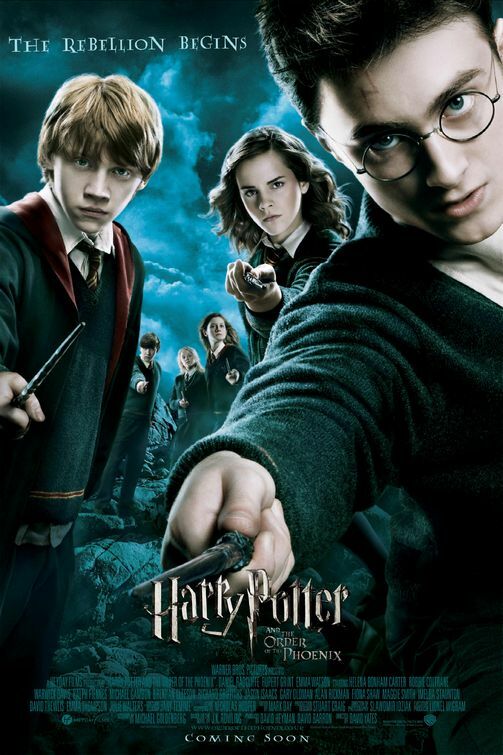 It holds more than one central story and like the best of the series so far, also explores the history of Potter and it’s supporting characters. That is one of the greater strengths of The Order of the Phoenix. It has a vast supporting cast this time, who get much more time to shine. From new addition Evanna Lynch as Luna Lovegood to the more familiar, like Bonnie Wright as Ginny Weasley, this film is much more about the students than the teachers. It also means that it is crammed with story and this can often mean moments feel lacking. This is the first Harry Potter film with no sign of Quidditch but it also results in other stories feeling under-developed, like the love story which carries from the previous movie. One scene could have neatly resolved the love story between Harry and Katie Leung’s Cho, but instead it lacks any real sense of conclusion. This also applies to the central mystery too. A great villain throughout doesn’t hide the fact that like some of the earlier Potter movies, the actual macguffin the heroes are searching for is never clear and it isn’t until a exposition heavy ending (delivered as usual by Dumbledore) that things become clearer. This is easily forgotten once the excellent, action-packed finale begins. This is a finale when there is fighting and spells being cast to ward of evil and it is done in a blistering, exciting and edge-of-the-seat way. Daniel Radcliffe holds his own as the heroic wizard, as does some other surprises like Gary Oldman and even Michael Gambon himself. It is also left on another loose cliffhanger of sorts and the series is ushered forward well. With each new installment of Harry Potter, there is some new excitement and the story progresses well as you await the next movie eagerly. Overall, Harry Potter and the Order of the Phoenix stays with the familiar format but adds a great villain in Umbridge and some excellent supporting characters and story development. Unfortunately, this also means that there is plenty left under-developed and although there is a great action-packed finale, it isn’t always clear what it is all about.